You know those times when you feel a little low, wrung out or sometimes just simply overindulged a bit? Here is an excellent remedy in the shape of soup with the Perfect Pick Me Up Soup recipe. This soup is a favourite when you feel you need a boost to the system and that usually means a significant quantity of healthy vegetables. What better way to tackle them than in a delicious, nutritious soup. 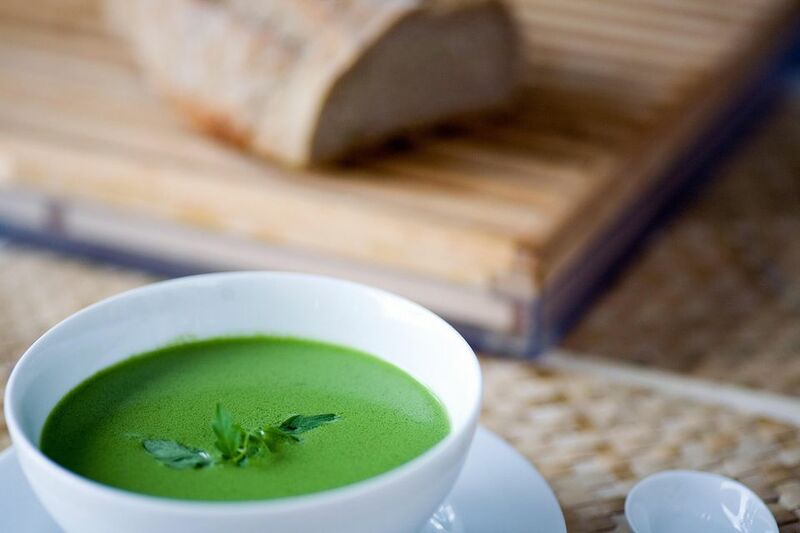 The soup is spinach with added vitamin-packed vegetables blended into a creamy soup which is also great if you are on a detox program or watching your weight. Don't get too hung up on the quantities,, so if you like more spinach, or you prefer watercress then go for it. Whatever you add will be great. Make a big pot full as it freezes well (don't leave it in the freezer longer than four weeks though). The soup will also keep well in the fridge for a few days, so handy for a refreshing, healthy lunch or even to replace a cup of tea or morning coffee. Yum. Add the spinach, watercress and rocket to the onion and stir really well. Add the vegetable stock and the potato. Bring to a boil, reduce to a gentle simmer and cook until the potato is soft but not broken up. Blend the soup using a hand blender or food processor. Only at this point should you test the seasoning, then add salt and pepper to your taste. Serve into warmed bowls or mugs. You can also serve with bread croutons or with a little Greek yoghurt or creme fraiche stirred through if you are not watching your weight. This recipe is quite loose, you can use the greens you like. Swap out some of the greens for super food kale, cabbage, Brussels, it really is up to you. Just try and keep a good mix of greens leaves and make sure you have some rocket and spinach in there.